The award-winning Holland and his ensemble, Autumn’s Child, will be in concert at 7:30 p.m. Saturday, Feb. 4 at the Center for Spirituality and Sustainability (the Dome) on the SIUE campus. The concert will feature the Native American flute along with piano, guitar, bass, cello and percussion. Holland started Autumn’s Child in 1995 and has released more than 20 CDs on his own label. He tours regularly throughout the country sharing his unique and skillful “playing from the heart” presentation. Seating is limited. For tickets, visit the Morris University Center Welcome Desk, visit artsandissues.com or call 1-866-698-4253. The Arts & Issues series brings artistic excellence to the SIUE campus through an eclectic blend of speakers and performers. For more than 31 years, SIUE’s Arts & Issues series has showcased some of the world’s finest artists. Each season, thought-provoking speakers inspire people of all ages and backgrounds. Thanks to the underwriting of SIUE, corporations, foundations and individual donors, tickets are often discounted as much as 50 percent. 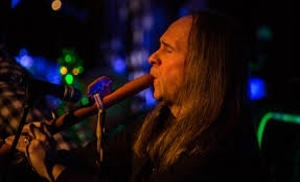 Mark Holland is considered one of the best performers in the world today on his instrument of choice, the Native American flute.